Yesterday on 8th February 2019, Congress President Rahul Gandhi addressed media on Rafale Scam, but BJP says that Rahul Gandhi is a Lier. Here is what Rahul Gandhi said on Rafale Scam. Read. In BJP's Defence, They made a list of 10 Lies. Lie No.1: Liar Rahul tried to twist some report in a French media house to say making Reliance an offsets partner was a tradeoff for Dassault to get the deal with India. Fact: Both the Supreme Court & Dassault CEO said Indian govt had nothing to do with choosing of offsets partners. Lie No.2: Liar Rahul tried to create false impression that SC has found grave irregularities with the deal. Indulged in third grade level propaganda on a sub judice matter. Fact: The Supreme Court dismissed the petitions filed by Congress proxies and held govt has done no wrong. Lie No.3: Liar Rahul claimed that a senior officer at MoD was ‘punished’ by Modi govt for submitting a dissent note on Rafale deal. Fact: #LiarRahul’s lies were shattered when the officer in question spoke to media and denied any kind of ‘punishment’. Lie No.4: Liar Rahul said ex-French President Hollande called PM Modi a thief and that Indian government had asked to include Reliance as offset partner. Fact: Hollande denied all such allegations. The French government issued an official statement. Lie No.5: Liar Rahul lied even to Parliament and said he personally confirmed from French President Mr. Macron that there is no non disclosure clause. Fact: French govt issued statement refuting liar's claim & said agreement prohibits parties from sharing classified information. Analysis: He deserves Nobel for lying. Lie No.7: Liar Rahul said that the processes and procedures laid down for military acquisitions were flouted by PM Modi’s government. Fact: Hon’ble SC in its judgment held: We are SATISFIED that there is no occasion to really doubt the process. Lie No.8: Liar Rahul said UPA negotiated price of Rs. 526/520/540 (one place, one price) crore per aircraft, while NDA settled for Rs.1,600 cr. Lie No.9: Liar Rahul said decision to procure 36 aircraft was made to benefit political “cronies” and has harmed Air Force. Fact: Hon SC held the decision was made in interest of defense preparedness in face of our adversaries’ ramping up their capabilities and IAF is happy. Lie No.10: Yesterday, Liar Rahul found a partner in crime - The Hindu. Using a conveniently cropped photo, they tried to lie again. Fact: We always knew Congressis were photoshoppers. But yesterday they learnt, the hard way, that ‘Satyamev Jayate’. Lie No.10: Yesterday, #LiarRahul found a partner in crime - The Hindu. Using a conveniently cropped photo, they tried to lie again. In addition to pathologically lying, #LiarRahul also insults the Indian Armed Forces. We wanted to demand an apology from the liar, but we are only empathising with him. Honestly, which human being with a working moral compass will ever say something as outrageous as this! If Liar Rahul and his partner in crime, The Hindu, really had faith in their 'discovery' they should've ideally wanted to approach Hon’ble SC with these 'discoveries'. But they know they won't stand a chance. Even now, we challenge liar to approach SC with his new 'evidence'. 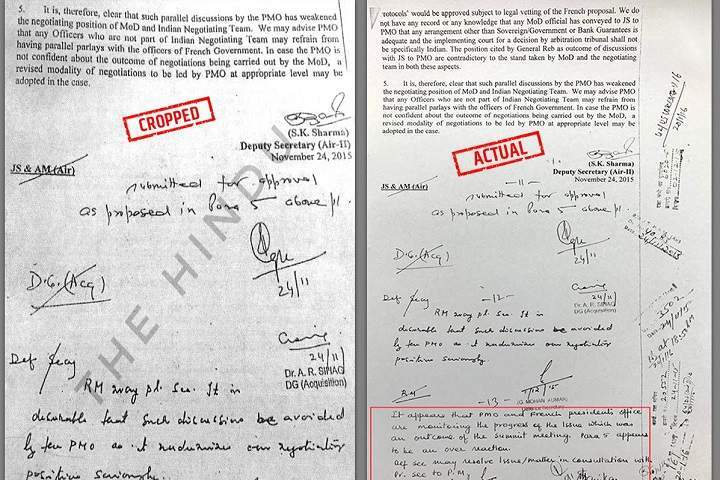 If #LiarRahul and his partner in crime, The Hindu, really had faith in their 'discovery' they should've ideally wanted to approach Hon’ble SC with these 'discoveries'. But they know they won't stand a chance.